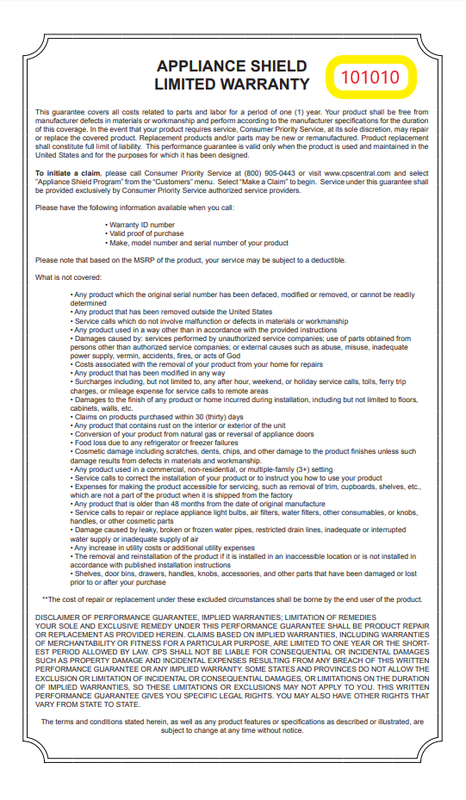 Locate the yellow Appliance Shield Warranty Card that you recevied when you purchased the item. Your Warranty Serial is located on the top right corner of the Appliance Shield Warranty Card in red print. As a leader and innovator in the field of service plans, Consumer Priority Service consistently exceeds industry standards when it comes to excellence in customer care and services. Our representatives are comprehensively trained in handling customer’s post-sale experience. We at Consumer Priority Service offer extended warranty coverage for virtually all high ticket consumer purchases ranging from high-end consumer electronics to computers to major appliances and more.